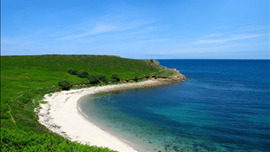 Originally part of an old farmhouse on the smallest of the Scilly Isles, Hell Bay makes the most of uninterrupted views across the headlands and the Atlantic Ocean. Inside it is filled with paintings and sculptures by famous artists with local connections, and the rooms have been exotically designed with cool fabrics conjuring up echoes of the Caribbean. 'Dawn-fresh' crabs, lobsters and other seafood are hand-picked from the local boats, and the kitchen procures daily supplies of meat and vegetables. Menus cover a lot of ground, but you can expect restaurant dishes such as roast Cornish goats' cheese with Bryher tomato confit, seared scallops with new potato salad and chilli syrup, and rack of lamb with mint jus and sage mash, plus straightforward desserts like lemon tart or chocolate truffle cake. Sandwiches and lighter dishes are available in the bar. Karma St Martin's is the first UK opening of the luxury expanding portfolio of five star hotels conceived by British entrepreneur and philanthropist, John Spence, which already has siblings in alluring exotic destinations such as Bali and Lombok, Indonesia and Jaipur, India.